Browse: Home /	Community Gardens, Composting, ZERO WASTE / Compost at Q Gardens! Recognize that beautiful 3-bin compost system? It’s from Sustainable Flatbush’s community compost site, formerly at the Flatbush Reformed Church. 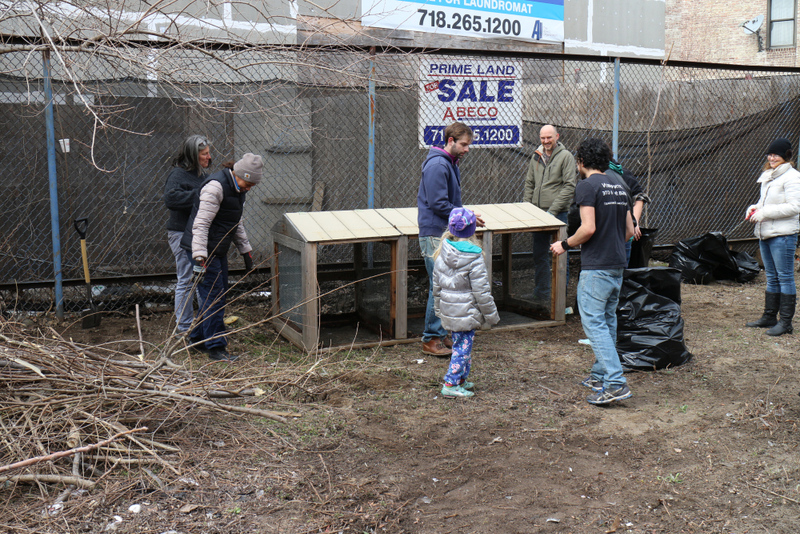 The bins have moved a few blocks west to our neighborhood’s newest community garden and compost site, located at East 18th Street and Church Avenue. Q Gardens already has its compost program up and running, and currently accepts kitchen scraps and other compostable materials three times a week. They will be participating in OpenBin NYC on Saturday May 9th, with dropoff hours from 12 noon to 3pm. Not sure what to bring? All the “dirt” (ouch) is here. Celebrate International Composting Awareness Week – yes, that’s a thing! – here in Flatbush! Stay updated on Q Gardens Compost hours here. Better yet, become a Q Gardens Compost Volunteer by emailing qgardensinfo@gmail.com for more info.